When my daughters were in the 5th grade they had to do what was called a "country report." This entailed writing a written report about a country to which they felt some connection, dressing in appropriate traditional clothes and serving some sort of dish native to the country. Drawing at my husband's heritage, my older daughter chose Scotland, and she baked shortbread from Sheila Lukins' Around the World cookbook. And thus began our love affair with homemade shortbread in general and that recipe in particular. - If you click over to the blog Une Gamine Dans la Cuisine, Valerie will have the recipe on her shortbread post. - I made half recipe of these cookies. 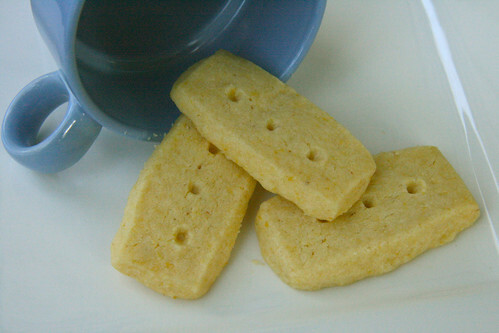 - Unlike my usual shortbread recipe, Dorie's recipe calls for both cornstarch and cornmeal, as well as lemon zest. - I always love a chance to roll cookie dough inside of a zipper plastic bag before chilling and cutting it. - As they baked, these cookies spread more than I would have liked. (I chose the best ones for the picture) But luckily, the shape didn't affect the flavor! Shortbread is always a favorite at our house, and this version was well-liked. It was perfectly baked; not dry at all, with a wonderful lemony flavor and a bit of a crunch from the cornmeal. The cookies were popular with our book group. Most of the cookies flew off the plate, and I left the remaining few with the host couple. In truth, these shortbread cookies don't match the buttery deliciousness of our usual shortbread, but I liked the special quirks provided by the lemon and cornmeal. Nancy how did you get yours to be so perfect? Mine turned into one big cookie in the oven!! Your cookies turned out beautifully! Thanks for baking along with me this week. Quite different from regular shortbread but a tasty variation. Glad they were enjoyed! What pretty cookies, Nancy! I have a go to shortbread recipe that uses rice flour, but I always use Dorie's ziploc bag technique. your shortbread fingers look fab! We had country reports too...I can't wait for my sons to have them...I think Korea will be an obvious and easy pick! Hope you have a great trip out west! The cookies look great, Nancy! The ziploc bag technique is brilliant, isn't it? The lemon and almond in these reminded me of your TWD pick, which I think I'll make again now that it's on my mind. mine didn't seem to spread too much. your cookies turned out so cute! I thought that these we so good, and I honestly wasn't looking forward to the recipe that much. I love the rectangles that you made! I like the rectangular shape of your cookies. I wasn't very precise and mine were a variety of interesting square-like shapes! i'm pretty sure i had to do a report like that, too, in elementary school. we also liked these quirky little cookies. I really like the way you shaped your cookies. I need to try these again, since I messed up on them the first time. I do like the idea of the cornmeal.